A fellow by the name of Tom Weiskopf came to the little town of Bellaire in northern Michigan and when he departed he left behind one whale of a golf course. Tom, as you know, knows a little about golf and from what I saw playing the Cedar River Golf Club he also knows quite a bit about golf course design. What makes a great golf course? The experts may talk about sand, grass, bunker placement, water, yardage and things like that. To me it all boils down to beauty and how playable the course is. 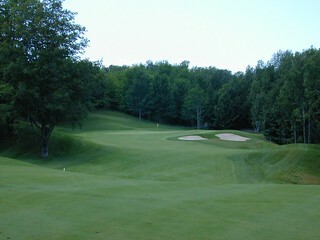 The Cedar River Golf Club has all the beauty any course would be happy to have and is fun to play. What more could we ask? You can play this course from about 6000 yards (white) to around 7000 yards (black) with the blue tee’s in between and the lady’s play to 5300 yards. After you pick the tees you want to play, the fun begins. This course is carved out of Northern Michigan hardwoods that make a perfect frame for the hole you are playing. The trees are set back just far enough to give you enough room if your shot is a little off line but they will come into play if you get a little too wild. 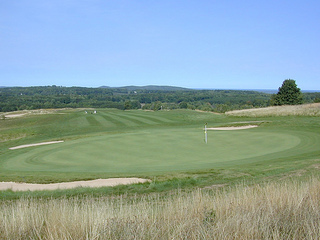 The whole course is on gently rolling hills that can make for some very interesting shots. 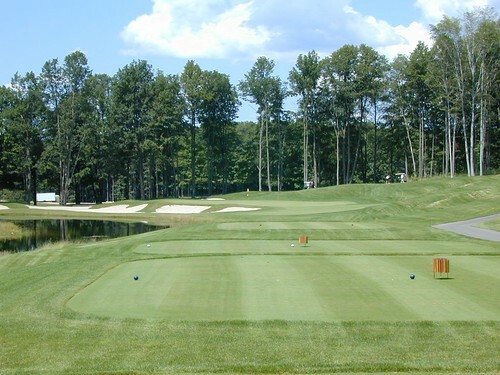 Take the big hardwood-lined fairways and add the hills and gullies and you may want to take your next shot with a camera. Keep in mind that one part of the Shanty Creek complex includes downhill and cross-country skiing, so that should give you some idea of the kind of terrain this course was built on. The bent grass fairways are wide enough that you don’t know how you can miss them, at least that’s what they tell me, but I enjoyed the roughs also. Unfortunately the roughs are also where they seem to like to put the bunkers. Most of the bunkers on this course are placed to keep you honest more than anything. If you hit a decent shot you reap the reward; if not, a bunker may be the place to look for your ball.. The greens are large and undulating but not overly so. They are fun greens to putt – sneaky brakes in them that makes no putt a sure thing. Unlike some greens I have played on, all these greens are fair, but you still have to look over the putts to spot those gentle breaks . Oh, did I mention the bunkers. They have them. In most cases you will have plenty of green to shot at but, depending on pin placement, you may want to challenge the bunker. It’s that old risk reward thing. 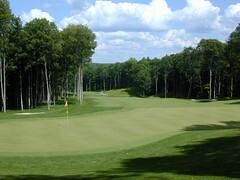 Go to the open part of the green and face a long putt or go for the short putt and risk a sand shot. Since we golfers tend to lose our smarts on shots like this, we also hit a lot of sand shots. I personally am not a fan of open golf courses but, surprisingly, one of the two open holes on this course sticks out in my mind. A short par four with nothing but water between you and the green with the fairway surrounding the right side of the small lake. A smart play would be to grab a 6 or 7 iron and play it safe and still have an easy shot at par. Do we do the smart thing?? Of course not, we grab the driver and see how much of the lake we can cut off. At least we do that the first time we play the hole; next time the 7 iron will be a good choice. Weiskopf gave us three short par fours on this course but he also made these holes some of the most fun to play because of the placement of either sand or water. From the time you tee it up until you sink the last putt you will have hole after hole of enjoyable golf. Hole 18, by the way, is one great finishing hole. A long narrow green with water to right and sand to the left So right down to your last iron shot this course gives you beauty and thrills. 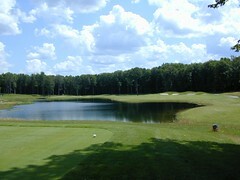 Personally I would like to thank Mr. Weiskopf for giving us such a great golf course. You should put this one on your “must play” list, you won’t regret it.